Identification of intracranial, atherosclerosis-related, large vessel occlusion (ICAS-LVO) is important to set up an optimal endovascular treatment strategy, as most ICAS-LVOs require specific endovascular modalities for efficient recanalization. However, there is currently no decisive way to identify ICAS-LVO for endovascular treatment. Instead of the few, non-specific, clinical and imaging findings that operators have depended on, this review focused on the occlusion type, one of angiographical methods to identify the ICAS-LVO. Occlusion type was originally devised for predicting procedural details and endovascular outcomes of ICAS-LVO. Among occlusion types, truncal-type occlusion is regarded as a surrogate marker for ICAS-LVO. Although rare, false positives or negatives in truncal-type occlusion are possible. Nonetheless, occlusion type was easy to apply and reliably predictive of procedural outcomes. Furthermore, occlusion type can be determined prior to the procedure, which could allow it to be more helpful in setting up an optimal strategy before starting endovascular treatment. Mechanical thrombectomy has become a standard treatment for acute, intracranial, large vessel occlusion (LVO) (1–3). Clinical outcomes of patients with an intracranial LVO have been remarkably improved by mechanical thrombectomy, and an improved recanalization rate was one of most important factors for these favorable outcomes (4). With modern endovascular devices (e.g., stent retriever, contact aspiration thrombectomy), 70–90% successful recanalization rates have been reported (5–9). Nevertheless, there are still a few problems with these devices. In spite of high recanalization rates, 40% futile recanalization rates—patients whose functional status is not independent—have been reported after endovascular treatment (EVT) (3, 10, 11). This might be because patient outcome is also affected by many other clinical and procedural factors, including time to recanalization, system of stroke care, and post-procedural management (12–14). In this regard, one of the most important modifiable factors is to set up an optimal endovascular strategy, because LVO can be effectively recanalized within a shorter timeframe using the optimal endovascular strategy (9). Acute, intracranial, atherosclerosis-related LVO (ICAS-LVO) is not rare (15). The reported frequency of ICAS-LVO in EVT-eligible patients varies across studies, ranging from 5 to 36% (16–28). More exactly, the frequency of ICAS-LVO depends on the definition used and the patients’ ethnicities, locations of occlusions, and eligible criteria for EVT (Table 1). In several studies from Korea, ICAS-LVO was found in 12–30% of study patients. Under the definition of significant fixed focal stenosis (FFS), the frequency was about 15–20%, although the precise definition was slightly variable across studies. Occlusion type, one of the major definitions used for ICAS-LVOs, also showed a similar range of frequencies, at about 12–18% (17, 18). ICAS-LVO is known to be more frequent in the posterior circulation (24, 32). In fact, one study reported that about 37% of ICAS-LVOs were in the posterior circulation (22). Based on angiographical determination, ICAS-LVOs seem to be less frequent in Western studies, at about 5–8% of EVT-eligible patients (19, 29). Table 1. Frequencies of intracranial atherosclerosis-related large vessel occlusion (ICAS-LVO) in endovascular treatment-eligible patients. Importantly, ICAS-LVO is considered a principal reason for failure of modern endovascular thrombectomy (17, 21, 23, 29). With modern endovascular modalities (e.g., stent retriever, contact aspiration thrombectomy), successful recanalization was possible in <30% of cases of ICAS-LVO (17, 23). Thus, the feasibility and safety of rescue endovascular modalities appropriate to ICAS-LVO (e.g., balloon angioplasty, stenting, intra-arterial glycoprotein IIb/IIIa inhibitor infusion) are constant points of discussion (17, 20, 23, 26, 28, 30–36). Although there is a lack of prospective studies regarding treatment of ICAS-LVO, most reports have indicated that ICAS-specific endovascular modalities are feasible in an acute setting. With optimal use of ICAS-specific endovascular modalities, patient outcome was also comparable to that of embolic occlusion (16, 23, 28). Finally, the rapid introduction of ICAS-specific endovascular modalities can be very important for timely and successful recanalization. Therefore, determination of ICAS-LVO seems essential and critical for selecting an optimal endovascular treatment strategy. However, disappointingly, there is no corroborant method to identify ICAS-LVO. Such an identification method should be reliable and show acceptable sensitivity and specificity. It should be predictive of procedural details and applicable during or before EVT to help operators establish an optimal endovascular strategy. Some demographics, clinical risk factors, and imaging findings have been reported to be associated with ICAS-LVO (24, 32, 37–39). However, these demographics and clinical risk factors might not be specific to ICAS-LVO. Only atrial fibrillation proved to be fairly predictive for endovascular outcomes and is a clinically used risk factor (18, 24, 40). Although atrial fibrillation is associated with a higher probability of embolic occlusion, this association might be circumstantial (32). Certain imaging findings, such as a hyperdense artery sign or blooming artifact, might be helpful but are still controversial regarding role in the etiology of acute LVO (37, 41). Unlike those less-specific identification methods, ICAS-LVO can be precisely identified angiographically (17, 32). Because angiographical determination has been most widely used in studies of ICAS-LVO, it is necessary to understand this method in depth to develop optimal endovascular treatment strategies. Among them, this review will discuss about the occlusion type—one of methods to identify the ICAS-LVO based exclusively on angiographical findings. Occlusion type is one of the most reliable angiographical surrogate markers for ICAS-LVO. Occlusion type was originally devised to differentiate ICAS-LVO from an embolic occlusion and was aimed for practical use in clinical settings (17). Before the introduction of occlusion type, clinical, and radiological findings (e.g., atrial fibrillation and hyperdense artery sign) were considered to presume an embolic occlusion. Although the concept of FFS was considered for similar purposes, it was used as merely an operational definition for ICAS-LVO and was not easy to apply during the procedure. More importantly, the predictive value of FFS for modern mechanical thrombectomy outcome has not been systemically evaluated (23). 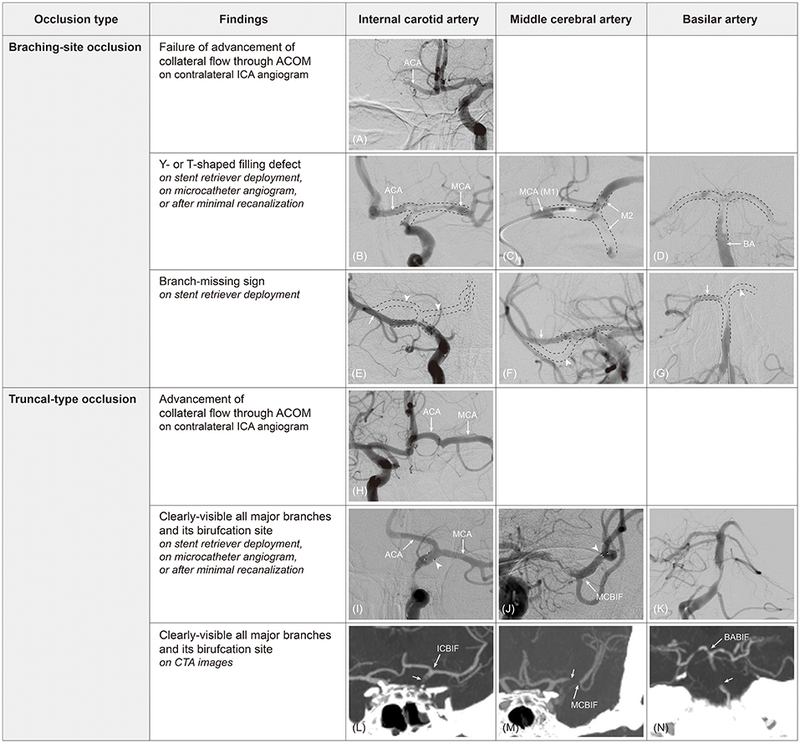 In contrast, occlusion type on computed tomography angiography (CTA) or digital subtraction angiography (DSA) was well correlated with procedural outcomes, especially in stent retriever thrombectomy (17, 18). The theoretical background of occlusion type for identification of ICAS-LVO is intuitive. For embolic occlusion, it is not likely for an embolus to be spontaneously halted in the middle of a normal artery. Instead, the embolus would likely become lodged at the site of an arterial bifurcation (i.e., a branching-site occlusion, BSO). In another words, an arterial occlusion found at the middle of an artery (i.e., truncal-type occlusion, TTO) is likely not caused by an embolus. In the narrow spectrum of occlusion etiologies of LVO, the TTO might be from an in situ thromboocclusion caused by an underlying ICAS. According to a study that evaluated this hypothesis, TTO was significantly associated with stent retriever failure (odds ratio (OR): 32.2; 95% confidence interval (CI): 7.78–133.0) and with none of the embolic sources, such as cardioembolism and artery-to-artery embolism (OR: 9.07; 95% CI: 3.74–22.0) (17). Impressively, patients with a TTO showed a much higher rate of reocclusion events than those with a BSO (77.3 vs. 5.0%; p < 0.001). Furthermore, most patients (78.9%) eventually needed rescue modalities to achieve a successful recanalization. It seems evident that the clinical and endovascular details of TTOs are comparable to those of ICAS-LVO (16, 21, 23, 28, 29). Thus, in situations where no confirmative identification method for ICAS-LVO is feasible during the procedure, occlusion type could be a helpful surrogate marker to identify ICAS-LVO. The ultimate goal in determining occlusion type was to help set up an optimal endovascular treatment strategy for ICAS-LVO. Therefore, the previous study originally focused on the predictive value of occlusion type for success of stent retrievers and the necessity of rescue modalities specific to ICAS-LVO. Based on the predictability of stent retriever successfulness in occlusion type, one could change endovascular modality from stent retriever to other modalities specific to ICAS-LVO earlier if TTO is observed. This strategy might avoid unnecessary trials of stent retriever and shorten procedural time. As for its practical application, occlusion type can be easily determined during endovascular procedures. Especially, in stent retriever thrombectomy, the occlusion type can be determined by a single stent retriever deployment across the occluded segment, as described in detail in the next section. Furthermore, occlusion type can be reliably determined before the endovascular procedure using preprocedural CTA (18). Early determination of occlusion type might be helpful in setting up the optimal endovascular treatment strategy. In addition, the predictive value of CTA-determined occlusion type was superior to atrial fibrillation or presence of a hyperdense artery sign, which have previously been the most widely considered pre-procedural identification methods, to presume occlusion etiology. Clinical outcomes according to occlusion type was reported (42). In the single center report of 318 patients, the TTO group showed a comparable recanalization rate with the BSO group (80.4 vs. 88.5%; p = 0.097), although procedural details were completely different. With the comparable recanalization rate, clinical outcomes including favorable outcome (modified Rankin Scale score at 3 months 0–2; 46.4 vs. 46.9%; p = 0.944), symptomatic intracranial hemorrhage, and mortality were not significantly different between the TTO and the BSO groups. Occlusion type can be classified as either BSO or TTO during endovascular procedures. For angiographical determination of BSO, the following findings can be considered (Table 2). First, on contralateral internal carotid artery (ICA) angiography, collateral flow through the anterior communicating artery (ACOM) cannot advance to the ipsilateral middle cerebral artery (MCA) if the ipsilateral ICA bifurcation site is involved, a so-called ICA T-occlusion (BSO; Figure 1A). In contrast to that, the collateral flow can advance further to the ipsilateral MCA through the ACOM system if an occlusion is located below the bifurcation site (TTO; Figure 1H). This finding has been commonly observed at the start of endovascular procedures during collateral evaluation. However, with the recent push to shorten the time to recanalization, the target vessel is treated without collateral assessment in most current endovascular procedures. Table 2. Angiographical findings suggestive of branching-site and truncal-type occlusions on catheter or digital subtraction angiography (DSA) and computed tomography angiography (CTA). Figure 1. Determination of occlusion type by digital subtraction angiography (DSA) and computed tomography angiography (CTA). On contralateral internal carotid artery (ICA) angiogram, collateral flow cannot advance to ipsilateral middle cerebral artery (MCA) through anterior communicating artery (ACOM) because ipsilateral ICA bifurcation (ICBIF) site is involved in branching-site occlusion (A). On the contrary, collateral flow can progress to ipsilateral MCA in truncal-type occlusion (H). In branching-site occlusion, Y- or T-shaped filling defect (clot) involving arterial bifurcation site can be observed on stent retriever deployment (B), on microcatheter angiogram (C), or after minimal recanalization (D). In addition, owing to the involvement of arterial bifurcation site, only one branch that stent retriever is deployed to can be seen on post-deployment angiogram in branching-site occlusion [arrow in (E–G)], while another branch is not seen [missing branch sign; arrowhead in (E–G)]. In truncal-type occlusion, all major branches and its bifurcation site can be clearly observed by stent retriever deployment [(I,J); arrowhead, distal markers of stent retriever], on microcatheter angiogram beyond occlusion, or after minimal recanalization (K). Those can also be observed on CTA images [(L–N); arrow, original occlusion point]. ACA, anterior cerebral artery; M2, superior and inferior divisions of middle cerebral artery; MCBIF, middle cerebral artery bifurcation site; BABIF, basilar artery bifurcation site. Second, Y- or T-shaped filling defects involving the bifurcation site can be directly observed during endovascular procedures by microcatheter angiogram, after partial recanalization by minimal thrombectomy procedure, or by angiogram performed with stent retriever in deployment (Figures 1B–D). Without doubt, these findings should be considered BSOs. Third, post-deployment angiography during stent retriever thrombectomy could give useful hints as to the occlusion type. For embolic occlusions in which an embolus might locate at the bifurcation site, the stent-through blood might only flow into the one branch where the stent retriever is deployed. Consequently, post-deployment angiography shows only one of all of the major branches (i.e., branch-missing sign, implicating BSO; Figures 1E–G). An angiographical territorial filling defect could be an indirect finding for the absence of the other major branches (Figure 2). If an occlusion is located at the arterial trunk, all major distal branches can be clearly seen by stent-through blood flow (TTO; Figures 1I,J). Figure 2. Angiographical territorial filling defect, suggestive of branching-site occlusion. On post-deployment angiogram during stent retriever thrombectomy, branch-missing sign can be observed (A,B, arrowhead). In patients whose missing branch is vague, angiographical filling defect could be helpful to guess the presence of the missing branch. On lateral view of post-deployment angiogram, corresponding territorial filling defect is seen (asterisk in C). On final angiogram, the missing branch is obviously observed (D). ICA, internal carotid artery; MCA, middle cerebral artery; ACA, anterior cerebral artery. To define the TTO, one should confirm that a bifurcation site and all its major distal branches are intact (distal confirmation). This distal confirmation can be performed by evaluating collateral flow through the ACOM system, microcatheter angiography beyond the occlusion site, stent-through blood flow across the occlusion site, or achievement of minimal recanalization (Figure 1K). More importantly, distal confirmation is also possible by CTA, which is more intuitive and easier than using catheter angiography or DSA (Table 2 and Figures 1L–N). In fact, its interrater agreement for classifying occlusion type was higher than that of DSA (kappa value 0.96 vs. 0.89) (18). Occlusion type is practically significant, is informative to set up an endovascular strategy, and is simpler to apply than FFS. In spite of these advantages, using DSA-determined occlusion type for identifying ICAS-LVOs has a few limitations. Above all, some additional manipulations are required for determination of occlusion type—for example, contralateral ICA angiography, microcatheter angiography beyond the occlusion, or post-deployment angiography. Among them, most determination practically depends on stent-through blood flow. Therefore, occlusion type often cannot be determined by DSA in patients who undergo non-stent retriever thrombectomy (e.g., contact aspiration thrombectomy), who did not have post-deployment angiography, or in whom stent-through blood flow was not achieved. In practice, occlusion type could not be determined by DSA in about 3.8% of patients (18). However, CTA findings are still helpful in those cases whose occlusion type cannot be determined by DSA. One of most important advantages of occlusion type is that it is not affected by treatment results. In contrast with FFS, occlusion type can be determined even in cases of persistent occlusion or incomplete recanalization. Furthermore, occlusion type is obviously unaffected by the remnants of emboli, vasospasm, and iatrogenic artery dissection. Although CTA can be useful for identifying occlusion type, there is still the problem of false classification. DSA- and CTA-determined occlusion types can contradict each other. 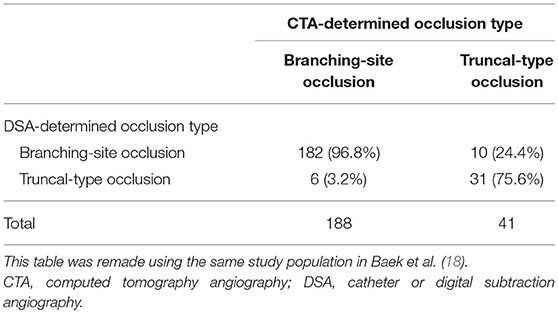 CTA-determined occlusion type was not in agreement with DSA-determined occlusion type in about 7.0% of patients (Table 3) (18). Among them, quite a few cases (62.5%, 10 of 16) had a DSA-determined BSO that was originally classified as a TTO on preprocedural CTA. One possible mechanism for this change in occlusion type is that distal migration of the clot which halted in the arterial trunk. In fact, half of these patients had a huge clot in the arterial trunk on DSA, which was observed as an angiographical filling defect (Table 4). Their original occlusion might have been a TTO in which the clot halted in the arterial trunk. However, on DSA, in addition to these clots in the arterial trunk, a distal BSO was also newly found. This finding is suggestive of distal migration of a proximal clot that halted in the arterial trunk to its distal bifurcation site, which finally led to the formation of a new, distal BSO that was not seen on preprocedural CTA. Similarly, in patient with BA occlusion, a new distal BSO might develop as a result of an artery-to-artery embolism from an ICAS-related lesion in the BA trunk. New distal BSOs were completely recanalized by stent retriever without residual stenosis in almost all cases. Although a few patients did not have a “truncal embolus” on DSA, complete distal migration of a proximal clot is a possible mechanism, in the same manner as described above. Table 3. Consistency of CTA- and DSA-determined occlusion type. Table 4. Summary of 10 patients who had CTA-determined truncal-type occlusion and DSA-determined branching-site occlusion (CTA-TTO with DSA-BSO). It remains unclear why an embolus would halt in the middle of an artery. In those patients, the arteries did not show any morphological abnormalities that would explain why an embolus could be caught. Instead, we hypothesize that it might relate to the size of the embolus—a very large embolus might become compacted and ultimately lodged in the tortuous but not stenotic middle trunk of an artery (e.g., cavernous segment of internal carotid artery). Also, hemodynamic flow competition forces can affect the migration of emboli. For example, if a patient had sufficiently strong collateral flow through the ACOM to elicit effective retrograde flow, it might be possible for an embolus to not advance to its bifurcation site. In fact, in these patients, most truncal emboli were found in the cervical or petro-cavernous segment of ICA, in whom ACOM is quite thick and therefore cross collateral flows are sufficiently strong (Table 4). Distal confirmation in CTA is dependent on visualization of a distal part of the artery beyond the occlusion. Because contrast media should reach the distal part of the artery beyond the occlusion, collateral flow is important in determining occlusion type by CTA. Collateral flow through the communicating arteries is important for distal confirmation in ICA or basilar artery occlusion. On the contrary, in MCA occlusion, leptomeningeal collateral flow, which shows greater individual differences, is important. Thus, CTA can misclassify truncal-type MCA occlusion as BSO if a patient has poor leptomeningeal collaterals to the MCA area. In fact, about 3.2% of CTA-determined BSOs were actually found to be TTOs on DSA (Table 3). Expectedly, all of these cases were MCA occlusions. Given this, CTA-determined occlusion type, which showed a higher sensitivity for detecting the BSO compared to TTO, might be slightly biased toward identifying BSO. This limitation could be overcome by using multiphase CTA, which can allow for sufficient time for retrograde filling of contrast media into the distal part of the artery. Among only a few identification methods, the ICAS-LVO can be feasibly identified by angiographical findings. The identification of ICAS-LVO based on based on occlusion type, is a reliable and practical identification method for ICAS-LVO. Procedural details by occlusion type and its predictability to endovascular results were reported. Furthermore, occlusion type can be determined before or in the early stages of the procedure, which may be most helpful in setting up an optimal endovascular treatment strategy. J-HB established the study idea, designed the manuscript structure, acquired and analyzed the data, and wrote the manuscript. BMK established the study idea, designed the manuscript structure, and made critical revisions to the manuscript with substantive intellectual content. This research was supported by a grant from the Korea Health Technology R&D Project through the Korea Health Industry Development Institute (KHIDI), funded by the Ministry of Health and Welfare, Republic of Korea (HC15C1056). 27. Yi TY, Chen WH, Wu YM, Zhang MF, Zhan AL, Chen YH, et al. Microcatheter “first-pass effect” predicts acute intracranial artery atherosclerotic disease-related occlusion. Neurosurgery. (2018). doi: 10.1093/neuros/nyy183. [Epub ahead of print]. Copyright © 2019 Baek and Kim. This is an open-access article distributed under the terms of the Creative Commons Attribution License (CC BY). The use, distribution or reproduction in other forums is permitted, provided the original author(s) and the copyright owner(s) are credited and that the original publication in this journal is cited, in accordance with accepted academic practice. No use, distribution or reproduction is permitted which does not comply with these terms.